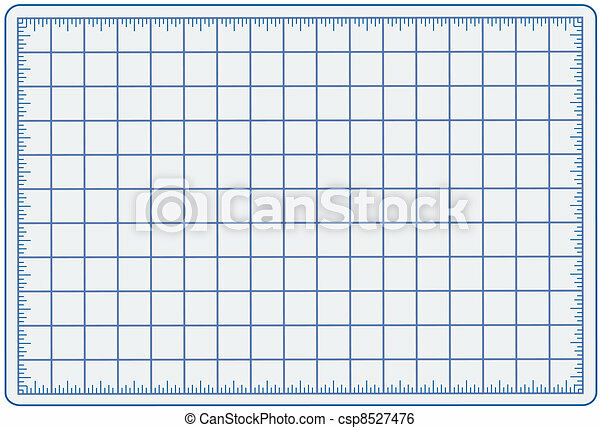 Cutting mat, blue. 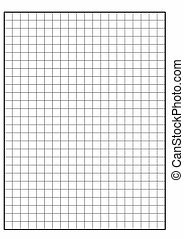 Blue self healing mat for measuring and cutting materials for arts, crafts, sewing, quilting, applique, patchwork, do it yourself projects. 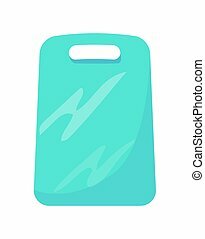 Blue self healing mat for measuring and cutting materials for arts, crafts, sewing, quilting, applique, patchwork, do it yourself projects. 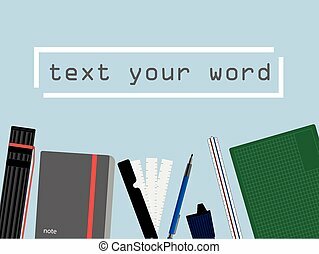 Background design of engineer or architect work and study tools with space for text. Vector illustration. 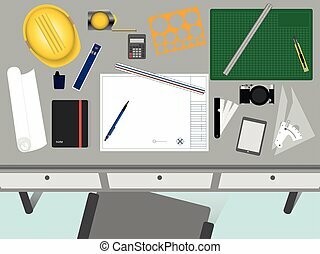 Top view of architect and engineer desk. Working space with blank paper for text. Background design. 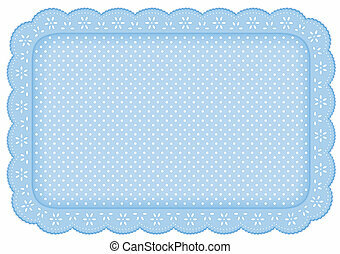 Eyelet lace doily place mat with polka dots in pastel blue for home decorating, setting table, arts, crafts, scrapbooks, backgrounds. EPS8 compatible. 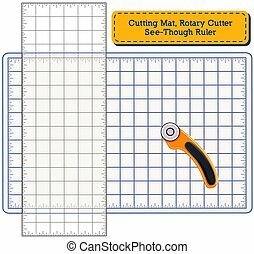 Self healing cutting mat, see through ruler and rotary blade cutter for do it yourself sewing, quilting, patchwork, appliqué, tailoring, arts and crafts projects. 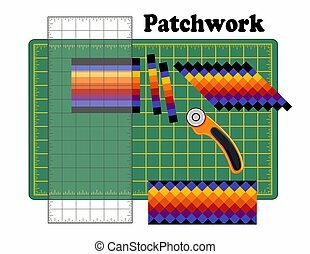 Patchwork DIY, Cutting Mat, Quilters Ruler, Rotary Blade Cutter, Traditional Strip Piece Pattern, reorganize strips into designs, for arts, crafts, sewing, quilting, do it yourself projects. 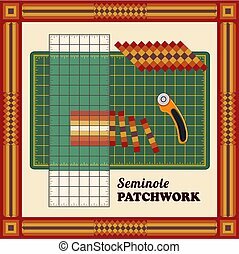 Patchwork DIY, Cutting Mat, Quilters Ruler, Rotary Blade Cutter, Traditional Seminole Strip Piece Pattern Frame, reorganize strips into designs, for arts, crafts, sewing, quilting, do it yourself projects. 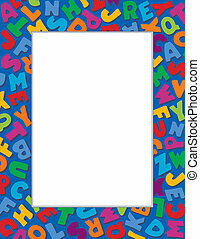 Alphabet Frame, multicolor letter border, blue background. 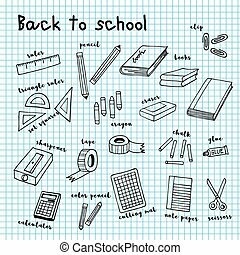 Copy space for education, literacy, back to school announcements, posters, fliers, stationery, scrapbooks, albums, do it yourself projects. 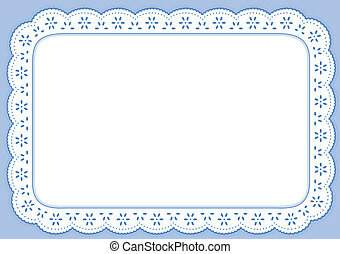 Eyelet lace doily picture frame, polka dots on pastel blue. Copy space for scrapbooks, albums, baby books. EPS8 compatible. 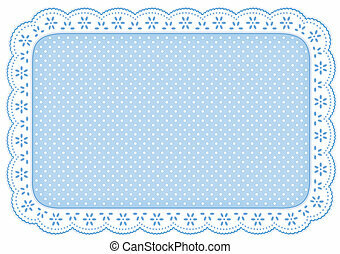 Decorative pastel blue eyelet lace placemat for home decorating, setting table, arts, crafts, scrap books, backgrounds, cake decorating. EPS8 compatible. 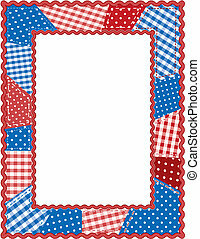 Red, white and blue quilted patchwork, rick rack frame. 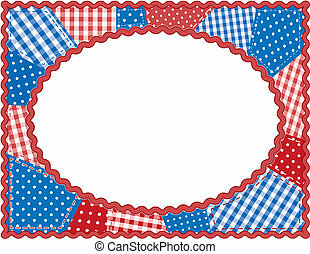 Copy space for announcements, posters, fliers, stationery, scrapbooks, albums, patriotic events and holidays. 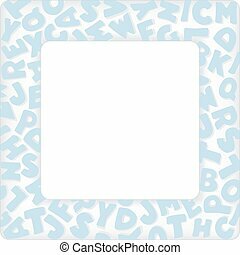 Original design multicolor alphabet on blue gingham check frame background with square copy space for baby books, school announcements, posters, fliers, scrapbooks, albums. EPS8 compatible. 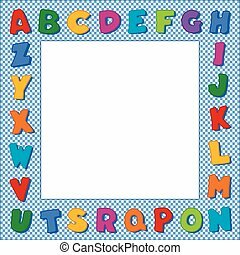 Alphabet Frame, square pastel blue letter border, white background. Copy space for baby books, albums, scrap books, announcements, invitations, posters, do it yourself crafts. EPS8 includes gradient mesh. 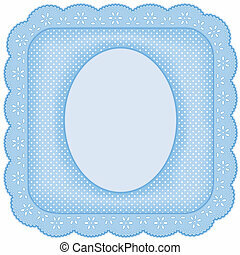 Antique heart white lace doily on pastel blue background. Copy space for Valentines Day, Mothers Day; albums, scrapbooks, birthdays, holidays, celebrations, cake decorating. EPS8 compatible. 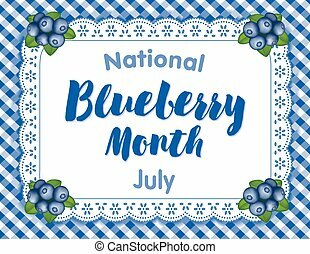 National Blueberry Month, celebrated each July in USA, juicy berries isolated on white eyelet lace doily place mat on blue gingham check background. 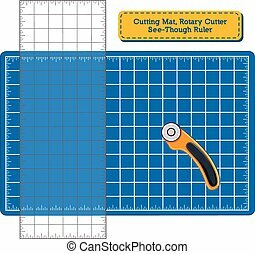 Self healing blue cutting mat and rotary blade cutter for do it yourself arts, crafts, sewing, quilting, applique and patchwork. EPS8 compatible. 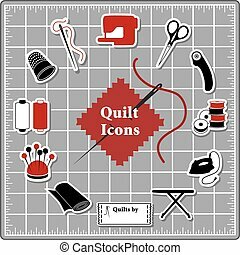 Quilting Icons for DIY sewing: pins, pincushion, needle, thread, iron, ironing board, scissors, bobbins, cloth, sewing machine, rotary cutter, thimble, tape measure, label on self healing cutting mat. 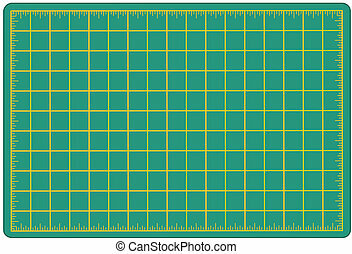 Green self healing mat for measuring and cutting materials for arts, crafts, sewing, quilting, applique, patchwork, do it yourself projects. 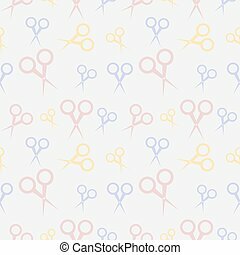 Quilting Stickers for DIY sewing: pins, pincushion, needle, thread, iron, ironing board, scissors, bobbins, cloth, sewing machine, rotary cutter, thimble, label on self healing cutting mat. 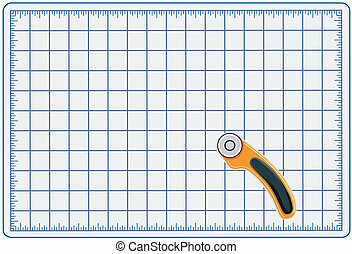 Self healing blue cutting mat, see-through ruler and rotary blade cutter for do it yourself sewing, quilting, patchwork, applique, tailoring, arts and crafts projects. EPS8 compatible. 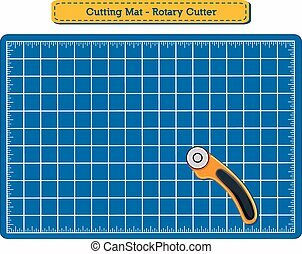 Blue self healing mat and rotary blade cutter for measuring and cutting materials for arts, crafts, sewing, quilting, applique, patchwork, do it yourself projects. 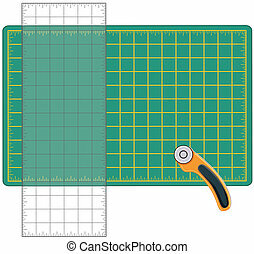 Icons of tools and supplies for sewing quilt, patchwork, applique, trapunto, textile arts and crafts on cutting mat grid. EPS8 compatible. 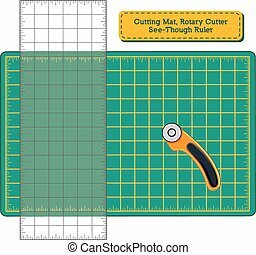 Self healing green cutting mat and rotary blade cutter for do it yourself arts, crafts, sewing, quilting, applique and patchwork. EPS8 compatible. 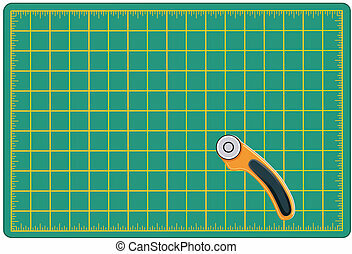 Self healing green cutting mat, see-through ruler and rotary blade cutter for do it yourself sewing, quilting, patchwork, applique, tailoring, arts and crafts projects. EPS8 compatible. 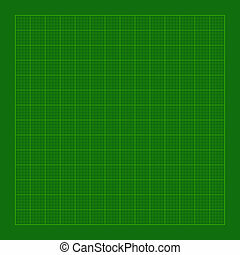 Quilting Icons for DIY sewing: pins, pincushion, needle, thread, iron, ironing board, scissors, bobbins, cloth, sewing machine, rotary cutter, thimble, tape measure on green self healing cutting mat. Quilting, patchwork, stitchery, applique, sewing, do it yourself craft and hobby icons isolated on cutting mat: flower head pins, pincushion, needle, thread, iron, embroidery scissors, bobbins, cloth swatches, sewing machine, safety pins, rotary cutter, ironing board, thread ripper, bobbins, EPS8. 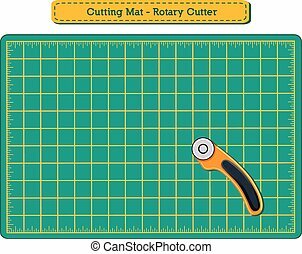 Green self healing mat and rotary blade cutter for measuring and cutting materials for arts, crafts, sewing, quilting, applique, patchwork, do it yourself projects. Tools and supplies icons for quilting, patchwork, stitchery, applique, sewing, do it yourself projects: flower head pins, pincushion, needle, thread, iron, embroidery scissors, bobbins, cloth swatches, quilting machine, safety pins, rotary cutter, ironing board, seam or thread ripper, bobbins, cutting mat. 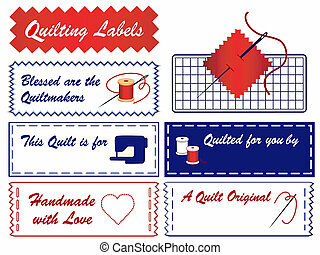 Quilt sewing labels in blue and red. 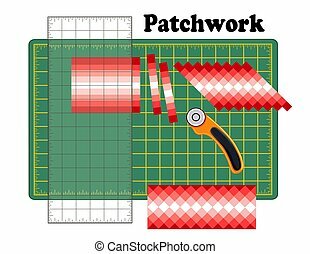 Copy space to customize with your name for quilting, patchwork, applique, trapunto, do it yourself crafts, hobbies. 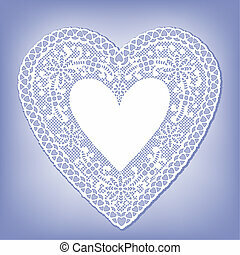 Features a cutting mat, needle, thread, sewing machine, heart, love. EPS8 compatible. Self healing cutting mat, transparent ruler, rotary blade cutter for arts, crafts, sewing, quilting, applique, patchwork, do it yourself projects.